Comment: Stacey Simpson Duke writes: “this is how hope gets its start—it emerges as a tiny tendril in an unexpected place” (Feasting on the Word, Year A, Volume 1, pg.28). This is the wonderful message that Isaiah brings us: a shoot from a stump, “hope from a tendril”, the anointed of the Lord appearing in righteousness. This tiny shoot becomes a strong branch—the mighty rising from the small, ultimately changing the face of the whole earth. That same root “stands a signal to all people”, and upon watching that signal, our own small tendrils grow into hope and peace, as well. In Let There Be Peace on Earth: And Let It Begin With Me, the familiar song has been given beautiful illustrations of the small acts of peace going on all over the world (it even includes an illustration of a lion with a lamb!). Just as Isaiah says that wolves and lambs, leopards and kids will lie down together in peace, led by one small child, so, too, we are led by that tiny shoot of hope springing from the stump of Jesse, and thus, the transformation of the whole world begins in the smallest of ways. 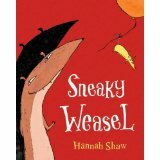 Comment: Sneaky Weasel tells the story of a weasel who tricks and connives and is generally nasty to his friends—and generally fails to see the consequences of his terrible actions, until he hosts a party and all the other animals refuse to attend. It is only upon confronting each injured friend that Sneaky Weasel learns that his sneakiness has backfired on him because the way he treats others has bigger ramifications than he realized. The Apostle Paul makes the same connection—he writes “May the God of steadfastness and encouragement grant you to live in harmony with one another…so that together you may with one voice glorify the God and Father of our Lord Jesus Christ.” Paul understands the connection between the way we treat others and the broader consequences. If we have failed to live in harmony, to welcome as we were welcomed, then it affects our ability to glorify God with one voice, it impedes the glory we would show God. Sneaky Weasel almost loses friends because he doesn’t consider the wider cost of his behavior. We can consider our behavior before the situation reaches Sneaky Weasel’s proportions, knowing that when we are living in harmony, welcoming, and thinking of others, then we can all glorify God together. Comment: John P. Burgess writes, “Matthew wants to make clear that the kingdom of God brings about a fundamental break with the past” (Feasting on the Word, Year A, Volume 1, pg.48). An ax cutting down unfruitful trees, a fire burning away chaff, and John’s call to repentance all characterize this fundamental break with the way things used to be. While alarming in some ways, John’s call to a baptism of repentance, and prediction of a baptism with the Spirit, open all who would have them to a new world, a new kingdom, “a break with the past”. In Chester’s Way, Chester and Wilson are very determined mice, entirely set in their ways, and completely threatened by the appearance of Lilly, who is, in many ways, so very different from them. But Chester and Wilson come to see, through an act of bravery on Lilly’s part, that her new ways may not be so much of a threat as an asset to them! In the same way, the call to repentance, while strong in its language and imagery, gives us a chance at a new way to live in the kingdom of God. The Lectionary Links this week are written by Sara Anne Berger, pastor of the Whitmire Presbyterian Church, Whitmire, SC. Lectionary Links: Sunday, December 8, 2013 by Storypath is licensed under a Creative Commons Attribution-NonCommercial 4.0 International License.